Received November 7, 2017; Revised January 1, 2018; Accepted January 2, 2018.; Published online April 5, 2018.
δ-Catenin, a member of the p120-catenin subfamily of armadillo proteins, reportedly increases during the late stage of prostate cancer. Our previous study demonstrates that δ-catenin increases the stability of EGFR in prostate cancer cell lines. However, the molecular mechanism behind δ-catenin-mediated enhanced stability of EGFR was not explored. In this study, we hypothesized that δ-catenin enhances the protein stability of EGFR by inhibiting its lysosomal degradation that is mediated by c-casitas b-lineage lymphoma (c-Cbl), a RING domain E3 ligase. c-Cbl monoubiquitinates EGFR and thus facilitates its internalization, followed by lysosomal degradation. We observed that δ-catenin plays a key role in EGFR stability and downstream signaling. δ-Catenin competes with c-Cbl for EGFR binding, which results in a reduction of binding between c-Cbl and EGFR and thus decreases the ubiquitination of EGFR. This in turn increases the expression of membrane bound EGFR and enhances EGFR/Erk1/2 signaling. Our findings add a new perspective on the role of δ-catenin in enhancing EGFR/Erk1/2 signaling-mediated prostate cancer. Epidermal growth factor receptor (EGFR; ErbB-1; and HER 1 in humans) is a transmembrane glycoprotein involved in regulating cellular proliferation, differentiation, and survival. It belongs to the ErbB family, which is comprised of four structurally related receptor tyrosine kinases, EGFR (ErbB-1), HER2/c-neu (ErbB-2), Her 3 (ErbB-3), and Her 4 (ErbB-4) (Herbst, 2004). Ligand binding to EGFR induces a conformational change of the receptor that transforms EGFR from its inactive monomeric form to active homo or heterodimers. EGFR dimerization subsequently induces autophosphorylation of several tyrosine (Y) residues (Y992, Y1045, Y1068, Y1148, and Y1173) in the cytoplasmic C-terminal domain. Phosphorylated tyrosine kinase residues act as docking sites for signal transducers and activators of intracellular substrates, which then initiate downstream signaling pathways (Prenzel et al., 2001; Scaltriti and Baselga, 2006; Tomas et al., 2014). Among these signaling pathways, the mitogen activated protein kinase (MAPK) signaling pathway is a major signaling cascade triggered by activation of EGFR. However, dysregulation of this pathway by over-expression, over-activation, or mutations in EGFR or other elements in the pathway results in upregulation of downstream signaling pathways leading to hyperproliferative diseases, like cancer (Normanno et al., 2006; Prenzel et al., 2001; Yarden, 2001). Overexpression of EGFR is found in many epithelial cancers, including prostate cancer (Di Lorenzo et al., 2002; Normanno et al., 2006; Yarden, 2001; Yarden and Sliwkowski, 2001). EGFR is known to be ubiquitinated by a RING domain E3 ligase, c-casitas b-lineage lymphoma (c-Cbl) (Grovdal et al., 2004; Levkowitz et al., 1998; 1999; Yokouchi et al., 1999). The c-Cbl is a member of the Cbl family, which also contains two other members, Cbl-b and Cbl-c/Cbl-3 (Thien and Langdon, 2005). The c-Cbl is composed of an N terminal transforming region (Cbl-N), which contains a phosphotyrosine binding (PTB) domain, and a C terminal modular region (Cbl-C) containing a RING motif, a large proline rich region, and a leucine zipper. While the PTB domain binds with the phosphotyrosine in the activated receptor as well as non-receptor tyrosine kinases, a RING finger domain interacts with ubiquitin conjugating enzymes (E2), and a large proline rich region interacts with SH3 domain-containing proteins (Lupher et al., 1998). c-Cbl binds to EGFR either directly through phosphorylated Tyr1045, or indirectly through Grb2 (Grovdal et al., 2004). c-Cbl binding and consequential phosphorylation activates its E3 ligase activity. Then, c-Cbl recruits the ubiquitin conjugating enzyme Ubc-H7 via its RING domain, leading to EGFR monoubiquitination and lysosomal degradation (Levkowitz et al., 1999; Yokouchi et al., 1999). δ-Catenin is a member of the p120-catenin (p120ctn) subfamily of armadillo proteins (Anastasiadis and Reynolds, 2000). It was first identified as a binding partner of presenilin-1 (PS-1) (Zhou et al., 1997). δ-Catenin binds to juxtamembrane domain region of E-cadherin, a classical cadherin involved in epithelial cell-cell adhesion (Kim et al., 2012; Yang et al., 2010). δ-Catenin is abundantly expressed in the brain and has been implicated in the regulation of dendrogenesis and cognitive functions (Israely et al., 2004; Kim et al., 2008). However, δ-catenin has been found to be overexpressed in different cancers in peripheral tissues, including prostate cancer tissues (Burger et al., 2002; Lu et al., 2005; 2009). Studies have demonstrated that δ-catenin plays a pivotal role in the progression of prostate cancer. An analysis of human prostate cancer and benign prostate tissue samples demonstrated that 85% of prostatic adenocarcinomas showed enhanced δ-catenin immunoreactivity, and the δ-catenin expression is correlated with increasing Gleason score (Lu et al., 2005). Furthermore, it has been reported that δ-catenin mRNA is overexpressed in prostate cancer in comparison to benign prostate hyperplasia (BPH) (Burger et al., 2002). The overexpression of δ-catenin promotes prostate cancer cell growth and progression by altering the cell cycle and profiles of survival genes (Zeng et al., 2009). Similarly, overexpression of EGFR has been found in prostate cancer (Di Lorenzo et al., 2002; Normanno et al., 2006; Yarden, 2001; Yarden and Sliwkowski, 2001). In addition, He et al. (2016) have demonstrated that interaction of EGFR to δ-catenin leads to δ-catenin phosphorylation and enhances EGFR signaling in prostate cancer cells (He et al., 2016). Due to these facts, we have selected prostate cancer cell for studying the underlying mechanism of increased EGFR stability in presence of δ-catenin. Previously, we demonstrated that δ-catenin overexpression increased the stability of EGFR (He et al., 2016). However, the molecular mechanism behind enhanced EGFR stability in presence of δ-catenin was not known. In the present study, we investigated the molecular mechanism behind increased EGFR stability in the presence of δ-catenin. We found that δ-catenin binds closely to sites EGFR Y1045 and competes with c-Cbl for EGFR binding leading to reduction in binding between EGFR and c-Cbl. This resulted in a decrease in ubiquitination and lysosomal degradation of EGFR, which increases protein expression of membrane bound EGFR. Ultimately, this result upregulates the activity of EGFR-mediated downstream signaling pathways, as seen in prostate cancer cells. The construction of GFP-δ-Catenin was previously described by Kim et al. (2002). Untagged δ-Catenin (RN) in the pEBG vector was provided by Professor Qun Lu from East Carolina University. The GFP-tagged EGFR, HA-tagged c-Cbl, HA-tagged c-Cbl C3AHN (RING finger domain deleted c-Cbl), and HA-tagged Ub were kindly provided by Professor Kwang Youl Lee from Chonnam National University. The construct of EGFR Y1045F-EGFP (#40267) in the pEGFP N3 vector was purchased from Addgene. The anti-δ-catenin (#611537) antibody was purchased from BD Bioscience (USA). The anti-GFP (#G1544) and anti-β-actin (#A5441) antibodies were bought from Sigma-Aldrich (USA). The anti-EGFR (1005) (#SC-03), anti-c-Cbl (C-15) (#SC-170), anti-Erk (C-140) (#SC-154) and anti-E-cadherin (SC-7870) antibodies were purchased from Santa Cruz Bio-technology, Inc., USA. The anti-p-Erk (P-p44/42 MAPK) (#9101S), anti-α-tubulin (#T9026) and anti-cleaved PARP (#9541) antibodies were from Cell Signaling Technology (USA). The HA epitope was detected using media from 12CA5 hybridomas provided by Professor Kwang Youl Lee from Chonnam National University. The epidermal growth factor (EGF) (#E9644) was obtained from Sigma-Aldrich (USA). Paclitaxel (#T7191) and MTS solution (#G3580) were purchased from Sigma-Aldrich (USA) and Promega Biotechnology company (USA) respectively. The M-MLV reverse transcriptase kit was obtained from Invitrogen (USA). The SYBR green was bought from Enzynomics (Korea). The CFX System was from Bio-Rad (USA). CWR22Rv-1 and PC3 (prostate cancer cells) were cultured in Rosswell Park Memorial Institute medium (RPMI) supplemented with 10% Fetal Bovine Serum (FBS) and 1% penicillin/streptomycin at 37°C with 5% CO2. Rv/δ and Rv/C cells overexpressing mouse GFP-δ-catenin and GFP, respectively, were derived from CWR22Rv-1 and were grown in RPMI supplemented with 10% FBS, 1% penicillin/streptomycin, and 125 μg/ml G418 (Sigma, St louis, MO) at 37°C with 5% CO2. CWR22Rv-1 and PC3 cells were transfected using PEI (#24765-2; Polysciences, Inc; USA) according to the manufacturer’s instructions. After 24 h of transfection, the CWR22Rv-1 cells were serum-starved for a further 1 day and treated with 100 ng/ml of EGF for the indicated time periods. Cell lysate preparation and immunoblotting were performed as described by Kim et al. (2005). Briefly, cells were harvested with lysis buffer (MLB) (10% glycerol, 25 mM HEPES, 150 mM NaCl, 1 mM EDTA, 25 mM NaF, 1 mM Na3VO4, 1% Nonidet P-40, 0.2 mM phenylmethylsulfonyl fluoride, and protease inhibitor mixture) and a protein assay was carried out with a BCA kit (Pierce, USA). Sample were run on Sodium dodecyl sulfate (SDS) gel and blotted on a polyvinylidene difluoride (PVDF) membrane. The membranes were blocked with 5% skim milk and were probed with the necessary primary antibodies followed by a secondary antibody. Finally, proteins were visualized using an enhanced chemiluminescence reagent (Millipore; USA). For immunoprecipitation, cell lysates were obtained as described above. Cell lysates were incubated with primary antibody according to the manufacturer’s protocol for 16 h at 4°C and purified with protein G sepharose beads (GE Healthcare, Sweden). The resulting immune complexes were washed three times and denatured at 95°C for 2 min with 15 μl of 2× sample buffer (0.1 M Tris-HCl, pH 6.8, 0.2 M DTT, 4% SDS, 20% glycerol, 0.2% bromophenol blue, and 1.43 M β-mercaptoethanol). The resulting samples were loaded on SDS-gel followed by immunoblotting. Biotinylation was performed as described by Kim et al. (2012). Briefly, CWR22Rv-1 cells were cultured in 100 mm dishes. After 24 h of transfection cells were serum-starved for 1 day and treated with 100 ng/ml EGF for the indicated time periods. The cells were washed gently with ice cold reaction buffer (0.1 M phosphate, 0.15 M Nacl, pH 8.0) twice. Furthermore, the cells were incubated with a mixture of ice-cold reaction buffer and 0.5 mM sulfo-NHS-SS-Biotin (Pierce, USA) at room temperature for 30 min. The cells were washed three times with ice cold reaction buffer and lysed in MLB lysis buffer. This procedure was followed by centrifugation at 13,200 rpm for 15 min at 4°C. The protein concentration in the resultant samples was measured, and equal amounts of protein lysates were used in a pull-down assay with streptavidin-agarose beads (Pierce, USA). Then, the purified proteins were subjected to immunoblotting. Biotinylated plasma membrane localized EGFR was detected by immunoblotting with anti-EGFR antibody. The quantitative real-time PCR was performed as described previously (Nguyen et al., 2014). Briefly, the total RNA was isolated from Rv/C and Rv/δ cells and 1 μg of total RNA was converted to cDNA using M-MLV reverse Transcriptase kit (Invitrogen, USA). Real-time PCR analysis using a SYBR green (Enzynomics, Korea) was performed by CFX System (Bio-Rad, USA). First, RV/C and RV/δ cells were cultured in 96 well. After 24 h, each of the wells were treated with 10 μM and 20 μM of paclitaxel (Sigma #T7191) for next 24 h. This was followed by the addition of a MTS solution (Promega #G3580) for 2 h. Then, the OD value was measured at wavelength of 492 nm. Since, 620 nm wavelength was used as reference wavelength, the OD value measured at 620 nm was subtracted from OD value measured at 420 nm to calculate cell viability. Each result is repeated in triplicate and an average of the results was taken. The statistical analysis was performed using the SigmaPlot version 10.0. The unpaired Student’s t test was used to determine the significance of our data. *p < 0.05, **p < 0.001 and ***p < 0.0001 were regarded as statistically significant. Our previous study showed that overexpression of δ-catenin enhances the stability of EGFR, thus upregulating EGFR/Erk1/2 signaling (He et al., 2016). However, the mechanism behind the effect of δ-catenin on EGFR was unknown. To determine the effect of δ-catenin overexpression on EGFR, we first examined the effect of δ-catenin on EGFR in the Rv/δ and Rv/C cell lines, which overexpress GFP-δ-catenin and GFP, respectively. Rv/δ and Rv/C cells were serum-starved for 1 day, and then treated with 100 ng/ml EGF for the indicated time periods, as shown in Fig. 1A. We observed that EGFR protein level was higher in Rv/δ cells than in Rv/C cells. Similarly, p-Erk1/2 expression was higher in Rv/δ cells than in Rv/C cells (Fig. 1A). To further investigate the effect of δ-catenin on membranous EGFR, we carried out a biotinylation experiment. In the absence of EGF, δ-catenin overexpression increased membrane bound EGFR. Similarly, in the presence of EGF, over-expression of δ-catenin resulted in increased level of membrane-bound EGFR, suggesting a protective role of δ-catenin on membranous EGFR (Fig. 1B). It is known that EGF induces activation of EGFR, followed by degradation and attenuation of EGFR and downstream signaling pathways (Roepstorff et al., 2009). Thus, our data indicates that δ-catenin protects EGFR from degradation, resulting in an increase in membranous EGFR protein expression, which in turn upregulates EGFR/Erk1/2 signaling. Several studies have suggested that EGFR is negatively regulated by c-Cbl, which monoubiquitinates EGFR, and thus facilitates its endocytosis followed by lysosomal degradation (de Melker et al., 2001; Kirisits et al., 2007; Levkowitz et al., 1998). To investigate the role of δ-catenin in lysosomal degradation of EGFR mediated by c-Cbl, we carried out a biotinylation experiment. We transiently transfected CWR22Rv-1 cells with the respective plasmids as shown in Fig. 2A. After 24 h of transfection, the cells were serum-starved for 1 day. This was followed by a treatment with 100 ng/ml EGF for 5 min. From the biotinylation experiment, we found that δ-catenin increased membranous EGFR even in presence of c-Cbl which mediates ubiquitination and degradation of EGFR (Fig. 2A). To confirm this data, we performed a similar set of experiments in PC3 cells. We transfected the plasmids as shown in Fig. 2C. After 24 h of transfection, PC3 cells were serum starved for next 24 h. Then, the cells were treated with 100 ng/ml EGFR for 5 min. We observed a similar result as in CWR22Rv-1 (Fig. 2C) i.e., the membrane bound EGFR was increased in the presence of δ-catenin, regardless of c-Cbl mediated EGFR ubiquitination. 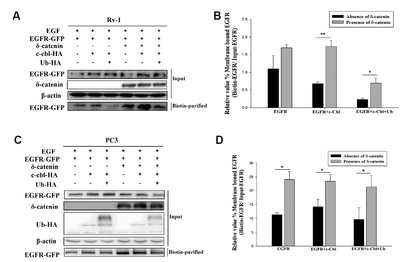 Both of these data suggest that δ-catenin protects EGFR from c-Cbl-mediated degradation and enhances EGFR protein stability in prostate cancer cells. Figure 2 demonstrates that overexpression of δ-catenin increases membranous EGFR regardless of the c-Cbl monoubiquitination of EGFR. However, the underlying mechanism that controls membranous EGFR stability in the presence of δ-catenin is unknown. Thus, we hypothesized that δ-catenin decreases the ubiquitination of EGFR mediated by c-Cbl. We overexpressed δ-catenin in a dose-dependent manner in CWR22Rv-1 cells and performed immunoprecipitation with anti-HA antibody. As expected, we found that ubiquitination of EGFR was decreased with an increase in the amount of δ-catenin in a dose-dependent manner (Fig. 3A). To further confirm this data, a reverse IP was performed with anti-EGFR antibody. We observed a decrease in ubiquitinated EGFR in the presence of δ-catenin (Fig. 3C). This further demonstrated that δ-catenin decreases the ubiquitination of EGFR, resulting in enhanced EGFR stability in the cell membrane. Interestingly, we also observed that binding of c-Cbl to EGFR was decreased in the presence of δ-catenin (Fig. 3C). Next, we performed similar experiment in PC3 cells. We observed similar result i.e., decrease in EGFR ubiquitination in presence of δ-catenin (Fig. 3E). 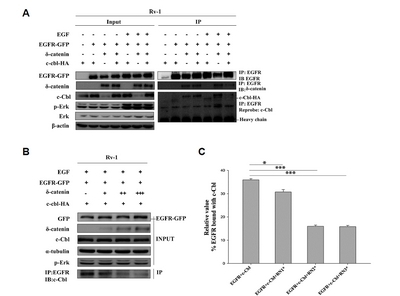 Taken together, these results indicate that δ-catenin reduces the binding of c-Cbl to EGFR, resulting in decreased EGFR ubiquitination and enhanced EGFR stability in the cell membrane. Furthermore, we investigated the effect of δ-catenin on the ubiquitination of EGFR in the presence of RING domain deleted c-Cbl. We observed that RING domain deleted c-Cbl did not induce EGFR ubiquitination. Moreover, δ-catenin had no effect on the ubiquitination of EGFR in the presence of RING domain deleted c-Cbl (Fig. 3G). This data further suggests that δ-catenin decreases the ubiquitination of EGFR mediated by the RING domain of c-Cbl. Previously, we demonstrated that δ-catenin binds with EGFR and this binding is reduced in response to EGF treatment (He et al., 2016). On the other hand, several other studies suggested that c-Cbl binds with EGFR in the presence of EGF and facilitates EGFR downregulation (de Melker et al., 2001; Kirisits et al., 2007; Levkowitz et al., 1998). Thus, to investigate the relationship among δ-catenin, c-Cbl, and EGFR, we overexpressed δ-catenin, EGFR-GFP, and c-Cbl-HA in CWR22Rv-1 cells. The transfected cells were serum starved for 1 day, and then treated with or without 100 ng/ml EGF for 2 min. The cells were treated with EGF for 2 min to observe optimum binding between δ-catenin and EGFR, and EGFR and c-Cbl. The long time EGF treatment facilitates EGFR endocytosis and lysosomal degradation of EGFR decreasing the membranous EGFR. Similarly, EGF treatment for longer period decreases the binding between EGFR and δ-catenin. The resultant lysates were immunopre-cipitated with anti-EGFR antibody. We observed that the binding between c-Cbl and EGFR was decreased in the presence of δ-catenin. Surprisingly, we also found that the binding between δ-catenin and EGFR was decreased in the presence of c-Cbl in EGF treated samples. 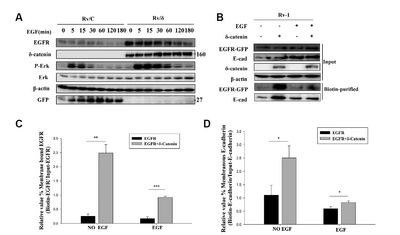 However, binding between δ-catenin and EGFR in the absence of EGF was not affected by c-Cbl (Fig. 4A). These data suggest that, in the presence of EGF, δ-catenin and c-Cbl compete with each other to bind with EGFR. To further confirm this result, we assessed the binding between EGFR and c-Cbl with a dose-dependent increase in δ-catenin. We observed results similar to those shown in Fig. 4A. Binding between c-Cbl and EGFR was reduced as the amount of δ-catenin was increased (Fig. 4B). Several studies have shown that c-Cbl can bind to EGFR either directly to the phosphorylated Tyr1045 residue or indirectly via Grb2 (Grøvdal et al., 2004). In our study, we investigated whether δ-catenin can affect direct or indirect binding of c-Cbl to EGFR. We found that δ-catenin had no effect on binding between the EGFR Y1045F mutant and c-Cbl (Fig. 5A), which suggests that δ-catenin decreases the direct binding between c-Cbl and EGFR at phosphorylated Tyr1045. However, it has no effect on the indirect binding of c-Cbl to EGFR via Grb2. δ-Catenin increased the stability of EGFR in prostate cancer cell lines (He et al., 2016). The mechanism behind the enhanced EGFR stability in the presence of δ-catenin was not found out in the previous study. This study shows that δ-catenin competes with c-Cbl for EGFR binding and decreases the ubiquitination of EGFR mediated by c-Cbl. We noted the downregulation of c-Cbl-mediated EGFR ubiquitination-reduces EGFR lysosomal degradation and enhanced stability of EGFR in the plasma membrane. EGFR controls a variety of biological processes, including cellular proliferation, differentiation, survival, and migration and has a vital role in physiological and pathological processes (Normanno et al., 2006). Thus, it is important to investigate the regulation of EGFR stability in tumor cells. Studies have shown that EGFR is upregulated by Fbw7 (Rocher-Ros et al., 2010) and hypoxic conditions (Franovic et al., 2007). However, it is downregulated by c-Cbl (Grøvdal et al., 2004; Levkowitz et al., 1998; 1999; Yokouchi et al., 1999), clathrin-dependent endocytosis (Huang et al, 2004), presenilin-1 (Repetto et al., 2007), and caspase-3 (He et al., 2006; Zhuang et al., 2003). Among these regulators of EGFR, c-Cbl is thought to be one of the most important regulator. During ligand-mediated EGFR activation, c-Cbl is phosphorylated and translocates to the cell membrane, where it binds to the activated form of EGFR and mediates EGFR ubiquitination and degradation (de Melker et al., 2001; Joazeiro et al., 1999; Levkowitz et al., 1998; Yokouchi et al., 1999). It is further known that δ-catenin enhances EGFR stability in prostate cancer cells (He et al., 2016). To rule out the possible role of δ-catenin in enhanced EGFR stability via its direct effects on c-Cbl, we first investigated the effect of δ-catenin on the stability of c-Cbl. We observed no changes in c-Cbl protein levels in the presence of δ-catenin. Studies have shown that c-Cbl mediated EGFR ubiquitination is necessary for its degradation (Grøvdal et al., 2004; Levkowitz et al., 1998; 1999; Longva et al., 2002; Yokouchi et al., 1999). EGFR is ubiquitinated by c-Cbl in order to progress from early to late endosomes (Ravid et al., 2004). Also c-Cbl remains associated with EGFR throughout the endocytic process (de Melker et al., 2001). Therefore, we next investigated the effect of δ-catenin on EGFR ubiquitination by c-Cbl. Interestingly, our biotinylation data showed that δ-catenin increased membranous EGFR protein levels, despite c-Cbl mediated ubiquitination of EGFR (Fig. 2). This finding further suggests that δ-catenin may affect the ubiq-uitination and degradation of EGFR and thus enhance EGFR stability. As expected, our immunoprecipitation data demonstrated a decrease in ubiquitination of EGFR by δ-catenin in a dose-dependent manner. We also found that binding between EGFR and c-Cbl is decreased in the presence of δ-catenin. Furthermore, we investigated the effect of δ-catenin on ubiquitination of EGFR in the presence of RING domain deleted c-Cbl. We observed that RING domain deleted c-Cbl did not induce EGFR ubiquitination. Moreover, δ-catenin had no effect on the ubiquitination of EGFR in the presence of RING domain deleted c-Cbl. This data further suggests that δ-catenin decreases the ubiquitination of EGFR mediated by the RING domain of c-Cbl. Our present data identifies the underlying mechanism by which δ-catenin increases EGFR stability and it’s downstream signaling and thus promotes tumorigenesis in prostate cancer cells. This data uncovers one of the key mechanisms by which δ-catenin controls EGFR signaling. Previously, we demonstrated that δ-catenin interacts with EGFR and this interaction is decreased in the presence of EGF (He et al., 2016). On the other hand, it has been reported that c-Cbl interacts with EGFR either directly through phosphorylated Tyr1045, or indirectly through Grb2 (Grøvdal et al., 2004). Thus, we hypothesized that δ-catenin competes with c-Cbl for EGFR binding. As expected, we observed that in the presence of EGF δ-catenin reduced the binding between EGFR and c-Cbl, which in turn led to a decreased ubiquitination and lysosomal degradation of EGFR. However, δ-catenin did not affect the binding between c-Cbl and the EGFR Y1045F mutant, suggesting that indirect binding of c-Cbl to EGFR via Grb2 is not affected by δ-catenin. Thus, we concluded that δ-catenin may interfere with direct binding between c-Cbl and EGFR phosphorylated at Tyr1045. On the other hand, we also found that binding between δ-catenin and EGFR was reduced by c-Cbl in the presence of EGF. However, the binding between EGFR and δ-catenin was not affected by c-Cbl in the absence of EGF, indicating that c-Cbl binding to EGFR in the presence of EGF decreases the binding between EGFR and δ-catenin. There are two reasonable explanations for this phenomenon: first, c-Cbl and δ-catenin may compete with each other for EGFR binding and thus reduce each other’s binding to EGFR. Second, in the presence of EGF, c-Cbl ubiquitinates EGFR and thus facilitates EGFR endocytosis, thereby decreasing the binding between EGFR and δ-catenin. He et al. also previously demonstrated that EGF treatment facilitated endocytosis of EGFR, but did not affect the localization of δ-catenin, which resulted in a reduction of binding between δ-catenin and EGFR. Upon ligand binding, EGFR is activated, which in turn leads to the induction of different signaling cascades. Among these, the EGFR/Erk1/2 signaling pathway is the most important signaling cascade which plays a pivotal role in governing cellular proliferation, survival, and metastasis (Herbst, 2004; Hynes and Lane, 2005; Yarden and Sliwkowski, 2001). Overexpression of EGFR upregulates the EGFR/ Erk1/2 signaling pathway, leading to the development of many diseases, including cancer. In this study, we found that δ-catenin enhanced membranous EGFR stability, resulted in increased EGFR/Erk1/2. A proposed model illustrating how δ-catenin enhances membranous EGFR stability is shown in Fig. 6. On EGF binding, EGFR undergoes dimerization and autophosphorylation at different tyrosine residues (Prenzel et al., 2001; Scaltriti and Baselga, 2006; Tomas et al., 2014). Then, the c-Cbl binds to EGFR and facilitates EGFR ubiquitination and lysosomal degradation (Grøvdal et al., 2004; Levkowitz et al., 1999; Yokouchi et al., 1999). On the other hand, δ-catenin, which is bound to juxta membranous region of E-cadherin (Kim et al., 2012), competes with c-Cbl for EGFR binding. This decreases the binding between c-Cbl and EGFR and inhibits EGFR ubiquitination, endocytosis, and lysosomal sorting. This in turn stabilizes EGFR and EGFR downstream signaling pathway. In this case, δ-catenin acts as a positive regulator for EGFR signaling. In conclusion, δ-catenin has a pivotal role in controlling membranous EGFR stability and its downstream signaling. Thus, our study demonstrates a novel mechanism by which δ-catenin controls EGFR signaling in prostate cancer cells. However, these findings were obtained mainly through the biochemical analysis of cultured cell lines. The physiological relevance of δ-catenin-mediated increase in EGFR signaling in different physiological or pathological conditions remains to be proven, in order to investigate its clinical potential usefulness as a therapeutic target for cancer in the future. Fig. 1B. (A) Rv/C and Rv/δ cells were serum starved for 24 h, and then treated with 100 ng/ml EGF for different times, followed by immunoblotting with specific antibodies. This experiment was repeated independently three times (B) Biotin-labeling purification of EGFR was carried out from the lysate obtained from transfection of δ-catenin in CWR22Rv-1 cells that were serum starved for 24 h and then treated with 100 ng/ml EGF for 5 min. The experiment was performed three times independently. (C) Quantitation of membranous EGFR shown in The data represents mean ± SD. (D) Quantitation of membranous E-cadherin shown in The data represents mean ± SD. All p values were determined with unpaired Student’s t test: *p < 0.05, **p < 0.001 and ***p < 0.0001. Fig. 3. (A) Ubiquitinated EGFR was detected by immunoprecipitation with anti-HA antibody followed by immunoblotting with anti-GFP antibody of lysate from transfecting respective plasmid in CWR22Rv-1 cells that were serum starved for 24 h followed by 100 ng/ml EGF treatment for 5 min. This data is representative of three independent experiments. (B) Quantitation of ubiquitinated EGFR (Fig. 3A). Data shown represents mean ± SD. (C) Immunoprecipitation with anti-EGFR antibody and immunoblotting with anti-HA antibody of lysates from CWR22Rv-1 cells that is transfected with respective plasmid and serum starved for 24 h followed by EGF 100 ng/ml treatment for 5 min. This experiment was done for three independent times. (D) Quantitation of ubiquitinated EGFR (Fig. 3C). Data shown represents mean ± SD. (E) Immunoprecipitation with anti-EGFR antibody and immunoblotting with anti-HA antibody of lysates from PC3 cells that are transfected with respective plasmid and serum starved for 24 h followed by EGF 100 ng/ml treatment for 5 min. Data represents three independent experiments. (F) Quantitation of ubiquitinated EGFR (Fig. 3E). Data shown represents mean ± SD. (G) Immunoprecipitation with anti-EGFR antibody and immunoblotting with anti-HA antibody of lysates from CWR22Rv-1 cells that is transfected with EGFR-GFP, Ub-HA, c-Cbl-HA and Ring domain deleted c-Cbl-HA that were serum starved for 24 h followed by EGF 100 ng/ml treatment for 5 min. (H) Quantitation Ubiquitinated EGFR (Fig. 3G). Data shown represents mean ± SD. All p values were determined with unpaired Student’s t test: *p < 0.05, **p < 0.001 and ***p < 0.0001. Fig. 4B. (A) Immunoprecipitation with anti-EGFR antibody followed by immunoblotting with anti- δ-catenin antibody and anti-c-Cbl antibody of lysate obtained from transfection of respective plasmid in CWR22Rv-1 cells that were serum starved followed by 2 min 100 ng/ml EGF treatment. 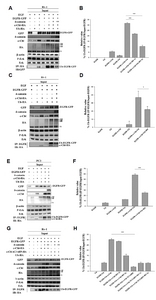 This experiment was performed three independent times (B) CWR22Rv-1 cells were transfected with EGFR-GFP, c-Cbl, and δ-catenin (one, two, and three times) and serum starved 24 h followed by 100 ng/ml EGF treatment for 2 min. Lysates were immunoprecipitated with an anti-EGFR antibody followed by immunoblotting with anti-c-Cbl and anti-EGFR antibodies. The data represents three independent experiments. (C) Quantitation of the data shown in Data shown represents mean ± SD. All p values were determined with unpaired Student’s t test: *p < 0.05, **p < 0.001 and ***p < 0.0001. Fig. 5. (A) Immunoprecipitation with anti-HA antibody followed by immunoblotting with anti- GFP antibody of lysate obtained from transfection of respective plasmid in CWR22Rv-1 cells that were serum starved followed by 5 min 100ng/ml EGF treatment. This experiment was performed three independent times (B) Quantitation of EGFR and EGFR Y1045 band intensity (Fig. 5A). Data shown represents mean ± SD. All p values were determined with unpaired Student’s t test: *p < 0.05, **p < 0.001 and ***p < 0.0001. Fig. 6. (A) Initially, EGFR exists in an inactive monomeric form on the cell surface. (B) Upon EGF binding, EGFR undergoes dimerization and autophosphorylation at several tyrosine residues. (C) c-Cbl binds either directly to EGFR phosphorylated at Y1045 or indirectly via Grb2 and facilitates ubiquitination of EGFR (D) δ-Catenin competes with c-Cbl for EGFR binding. This in turn decreases the binding between c-Cbl and EGFR, leading to decreased EGFR ubiquitination and degradation. Anastasiadis, PZ, and Reynolds, AB (2000). The p120 catenin family:complex roles in adhesion, sinalign and cancer. J Cell Sci. 113, 1319-1334. Burger, MJ, Tebay, MA, Keith, PA, Samaratunga, HM, Clements, J, Lavin, MF, and Gardiner, RA (2002). Expression analysis of delta-catenin and prostate-specific membrane antigen: their potential as diagnostic markers for prostate cancer. Int J Cancer. 100, 228-237.
de Melker, AA, van der Horst, G, Calafat, J, Jansen, H, and Borst, J (2001). c-Cbl ubiquitinates the EGF receptor at the plasma membrane and remains receptor associated throughout the endocytic route. J Cell Sci. 114, 2167-2178. Di Lorenzo, G, Tortora, G, D’Armiento, FP, De Rosa, G, Staibano, S, Autorino, R, D’Armiento, M, De Laurentiis, M, De Placido, S, and Catalano, G (2002). Expression of epidermal growth factor receptor correlates with disease relapse and progression to androgen-independence in human prostate cancer. Clin Cancer Res. 8, 3438-3444. Franovic, A, Gunaratnam, L, Smith, K, Robert, I, Patten, D, and Lee, S (2007). Translational up-regulation of the EGFR by tumor hypoxia provides a nonmutational explanation for its overexpression in human cancer. Proc Natl Acad Sci USA. 104, 13092-13097. Gr⊘vdal, LM, Stang, E, Sorkin, A, and Madshus, IH (2004). Direct interaction of Cbl with pTyr 1045 of the EGF receptor (EGFR) is required to sort the EGFR to lysosomes for degradation. Exp Cell Res. 300, 388-395. He, Y-Y, Huang, J-L, and Chignell, CF (2006). Cleavage of epidermal growth factor receptor by caspase during apoptosis is independent of its internalization. Oncogene. 25, 1521-1531. He, Y, Ryu, T, Shrestha, N, Yuan, T, Kim, H, Shrestha, H, Cho, YC, Seo, YW, Song, WK, and Kim, K (2016). Interaction of EGFR to δ-catenin leads to δ-catenin phosphorylation and enhances EGFR signaling. Sci Rep. 6, 21207. Herbst, RS (2004). Review of epidermal growth factor receptor biology. Int J Rad Oncol Biol Phys. 59, 21-26. Huang, F, Khvorova, A, Marshall, W, and Sorkin, A (2004). Analysis of clathrin-mediated endocytosis of epidermal growth factor receptor by RNA interference. J Biol Chem. 279, 16657-16661. Hynes, NE, and Lane, HA (2005). ERBB receptors and cancer: the complexity of targeted inhibitors. Nat Rev Cancer. 5, 341-354. Israely, I, Costa, RM, Xie, CW, Silva, AJ, Kosik, KS, and Liu, X (2004). Deletion of the neuron-specific protein delta-catenin leads to severe cognitive and synaptic dysfunction. Curr Biol. 14, 1657-1663. Joazeiro, CA, Wing, SS, Huang, H, Leverson, JD, Hunter, T, and Liu, YC (1999). The tyrosine kinase negative regulator c-Cbl as a RING-type, E2-dependent ubiquitin-protein ligase. Science. 286, 309-312. Kim, K, Sirota, A, Chen Yh, YH, Jones, SB, Dudek, R, Lanford, GW, Thakore, C, and Lu, Q (2002). Dendrite-like process formation and cytoskeletal remodeling regulated by delta-catenin expression. Exp Cell Res. 275, 171-184. Kim, H, Ki, H, Park, H-S, and Kim, K (2005). Presenilin-1 D257A and D385A mutants fail to cleave Notch in their endoproteolyzed forms, but only presenilin-1 D385A mutant can restore its gamma-secretase activity with the compensatory overexpression of normal C-terminal fragment. J Biol Chem. 280, 22462-22472. Kim, H, Han, JR, Park, J, Oh, M, James, SE, Chang, S, Lu, Q, Lee, KY, Ki, H, and Song, WJ (2008). Delta-Catenin-induced dendritic morphogenesis: An essential role of p190RhoGEF interaction through AKT1-mediated phosphorylation. J Biol Chem. 283, 977-987. Kim, H, He, Y, Yang, I, Zeng, Y, Kim, Y, Seo, YW, Murnane, MJ, Jung, C, Lee, JH, and Min, JJ (2012). δ-Catenin promotes E-cadherin processing and activates δ-catenin-mediated signaling: Implications on human prostate cancer progression. Biochimi Biophys Acta. 1822, 509-521. Kirisits, A, Pils, D, and Krainer, M (2007). Epidermal growth factor receptor degradation: An alternative view of oncogenic pathways. Int J Biochem Cell Biol. 39, 2173-2182. Levkowitz, G, Waterman, H, Zamir, E, Kam, Z, Oved, S, Langdon, WY, Beguinot, L, Geiger, B, and Yarden, Y (1998). c-Cb1/Sli-1 regulates endocytic sorting and ubiquitination of the epidermal growth factor receptor. Genes Dev. 12, 3663-3674. Levkowitz, G, Waterman, H, Ettenberg, SA, Katz, M, Tsygankov, AY, Alroy, I, Lavi, S, Iwai, K, Reiss, Y, and Ciechanover, A (1999). Ubiquitin ligase activity and tyrosine phosphorylation underlie suppression of growth factor signaling by c-Cbl/Sli-1. Mol Cell. 4, 1029-1040. Longva, KE, Blystad, FD, Stang, E, Larsen, AM, Johannessen, LE, and Madshus, IH (2002). Ubiquitination and proteasomal activity is required for transport of the EGF receptor to inner membranes of multivesicular bodies. J Cell Biol. 156, 843-854. Lu, Q, Dobbs, LJ, Gregory, CW, Lanford, GW, Revelo, MP, Shappell, S, and Chen, YH (2005). Increased expression of delta-catenin/neural plakophilin-related armadillo protein is associated with the down-regulation and redistribution of E-cadherin and p120ctn in human prostate cancer. Hum Pathol. 36, 1037-1048. Lu, Q, Zhang, J, Allison, R, Gay, H, Yang, W-X, Bhowmick, NA, Frelix, G, Shappell, S, and Chen, YH (2009). Identification of extracellular delta-catenin accumulation for prostate cancer detection. The Prostate. 69, 411-418. Lupher, ML, Andoniou, CE, Bonita, D, Miyake, S, and Band, H (1998). Molecules in focus: The c-Cbl oncoprotein. Int J Biochem Cell Biol. 30, 439-444. Nguyen, TT, Yoon, S, Yang, Y, Lee, H, Bin Oh, S, Jeong, MH, Kim, JJ, Yee, ST, Crişan, F, and Moon, C (2014). Lichen secondary metabolites in Flavocetraria cucullata Exhibit anti-cancer effects on human cancer cells through the induction of apoptosis and suppression of tumorigenic potentials. PLoS One. 9, e111575. Normanno, N, De Luca, A, Bianco, C, Strizzi, L, Mancino, M, Maiello, MR, Carotenuto, A, De Feo, G, Caponigro, F, and Salomon, DS (2006). Epidermal growth factor receptor (EGFR) signaling in cancer. Gene. 266, 2-16. Prenzel, N, Fischer, OM, Streit, S, Hart, S, and Ullrich, A (2001). The epidermal growth factor receptor family as a central element for cellular signal transduction and diversification. Endocr Relat Cancer. 8, 11-31. Ravid, T, Heidinger, JM, Gee, P, Khan, EM, and Goldkorn, T (2004). c-Cbl-mediated ubiquitinylation is required for epidermal growth factor receptor exit from the early endosomes. J Biol Chem. 279, 37153-37162. Repetto, E, Yoon, IS, Zheng, H, and Kang, DE (2007). Presenilin 1 regulates epidermal growth factor receptor turnover and signaling in the endosomal-lysosomal pathway. J Biol Chem. 282, 31504-31516. Rocher-Ros, V, Marco, S, Mao, J-H, Gines, S, Metzger, D, Chambon, P, Balmain, A, and Saura, C (2010). Presenilin modulates EGFR signaling and cell transformation by regulating the ubiquitin ligase Fbw7. Oncogene. 29, 2950-2961. Roepstorff, K, Grandal, MV, Henriksen, L, Knudsen, SLJ, Lerdrup, M, Gr⊘vdal, L, Willumsen, BM, and Van Deurs, B (2009). Differential effects of EGFR ligands on endocytic sorting of the receptor. Traffic. 10, 1115-1127. Scaltriti, M, and Baselga, J (2006). The epidermal growth factor receptor pathway: a model for targeted therapy. Clin Cancer Res. 12, 5268-5272. Thien, CBF, and Langdon, WY (2005). c-Cbl and Cbl-b ubiquitin ligases: substrate diversity and the negative regulation of signalling responses. Biochem J. 391, 153-166. Tomas, A, Futter, CE, and Eden, ER (2014). EGF receptor trafficking: consequences for signaling and cancer. Trends Cell Biol. 24, 26-34. Yang, I, Chang, O, Lu, Q, and Kim, K (2010). δ-catenin affects the localization and stability of p120-Catenin by competitively interacting with E-cadherin. Mol Cells. 29, 233-237. Yarden, Y (2001). The EGFR family and its ligands in human cancer. signalling mechanisms and therapeutic opportunities. Eur J Cancer. 37, S3-S8. Yarden, Y, and Sliwkowski, MX (2001). Untangling the ErbB signalling network. Nat Rev Mol Cell Biol. 2, 127-137. Yokouchi, M, Kondo, T, Houghton, A, Bartkiewicz, M, Horne, WC, Zhang, H, Yoshimura, A, and Baron, R (1999). Ligand-induced Uubiquitination of the epidermal growth factor receptor involves the interaction of the c-Cbl RING Finger and UbcH7. J Biol Chem. 274, 31707-31712. Zeng, Y, Abdallah, A, Lu, J-P, Wang, T, Chen, Y-H, Terrian, DM, Kim, K, and Lu, Q (2009). δ-Catenin promotes prostate cancer cell growth and progression by altering cell cycle and survival gene profiles. Mol Cancer. 8, 19. Zhou, J, Liyanage, U, Medina, M, Ho, C, Simmons, AD, Lovett, M, and Kosik, KS (1997). Presenilin 1 interaction in the brain with a novel member of the Armadillo family. Neuroreport. 8, 2085-2090. Zhuang, S, Ouedraogo, GD, and Kochevar, IE (2003). Downregulation of epidermal growth factor receptor signaling by singlet oxygen through activation of caspase-3 and protein phosphatases. Oncogene. 22, 4413-4424.